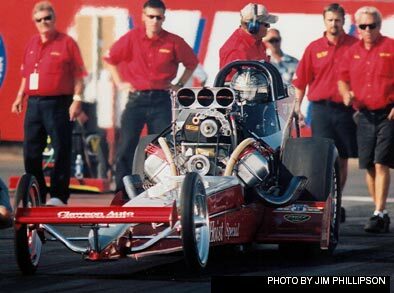 Burbank, CA (05-30-03) After a short break to work on other business projects, Bob Muravez, AKA Floyd Lippencotte, Jr., announced today that he would be returning to the driver's seat in the Western Hoist Nostalgia Top Fuel dragster, owned by Jon and Jeannie Halstead. Also returning to the Western Hoist camp is Crew Chief, Chris Nance, and the other crew members of the Lippencotte Racing team, all anxious to step up performance and be "a five second player" on the highly competitive Nostalgia Top Fuel circuit. Muravez's first race back behind the wheel will be at the GoodGuys-VRA "West Coast Hot Rod Happening" June 27-29, 2003, in Pomona, CA, where Saturday night qualifications will give hard-core nitro fans a spectacular show. Muravez, in association with Applecast Streaming Video Services, will also bring racing excitement to fans around the world via a new communication technology -- broadcasting live action digital video over the Internet. Lippencotte Race Team's website, www.akaracing.com in association with WDIFL.com will allow fans to experience live rides with Floyd and other drivers down the quarter-mile with the revolutionary "Ride Cam" mounted onboard the Top Fuel dragsters. Fans can also view all the action in the Western Hoist pit and other excitement around the track with the roving "Thrash Cam". Viewers will be able to log onto the Web and be in the middle of the action all weekend.